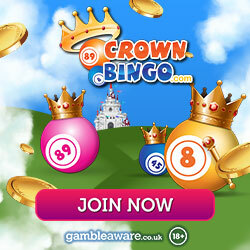 Every day between 11am and 9pm at half past the hour, Crown Bingo offers you the chance to play bingo completely free! You’ll find these great free games in Room 2 there’s £10 per hour to be won so a total of £100 over the course of the day. Not only do you get to play free bingo on a daily basis at Crown but they also have free bingo Sundays which take place every week and offer double the number of free games for longer! There are 2 free bingo games per hour between Midday and Midnight giving you even more free cash than any other day of the week! When you join Crown Bingo you will be given a £5 welcome bonus which gives new members £5 worth of free bingo games, and what’s more the Chat Games boast £5 a day in Bingo Bonus prizes too so there’s more than one to get your free bingo fix at Crown. On Tuesday mornings you can take part in Tournament Bingo from 10am and Friday Nights from 6pm, top players can win up to £15 giving you even more free games with your winnings! Team Bingo is the monthly competition which sees Teams collect points for all of their Bingo wins; the team who has the most points at the end of the month wins £500 of Free Bingo money! So if like us, you love a freebie then you must check out Crown Bingo who have loads of ways you can play your favourite games and it won’t cost you a penny but remember you need to be a member first so sign up and then you’re good to go!